UCA has hosted students from dozens of nations over the past fifteen years, helping them learn and gain acceptance in quality colleges and universities. Smaller class sizes, a safe rural environment, and dedicated faculty make the UCA experience uniquely qualified to prepare students to succeed. International students are immersed in highly academic and elevated classes, while an ESL teacher offers guidance with class assignments to ensure success. Our reputation with colleges and a dedication of the entire faculty to assist in college entrance requirements ensures a student a strong chance of a future they desire. While some schools place international students in dormitories, UCA houses students with host families, providing international visitors a unique view into family culture in the Northeast Kingdom of Vermont. Becoming part of the UCA family is one of the most solid educational investments available for international families. Nearly 100% of all UCA graduates wishing to enter college are accepted at multiple college and universities. Many UCA Alumni have become doctors, educators, and business leaders. Graduating classes are offered more per capita scholarship aid than others in the region. An "English as a Second Language" class offers our International Students an opportunity to receive extra English help in their classwork. Used as a tutoring time, Mrs. Barker, our ESL: Bible Teacher, Literature, Writing, and History Support specialist, is always standing by to help our International Students with their academic requirements. Mrs. Barker's care goes beyond the classroom as well, always offering helpful life-coaching and guidance. Each student at UCA is counseled by our own faculty. Because of our small numbers, we are able to spend one-on-one time with our students, guiding them all through high school on how to prepare for and successfully enter college upon graduation. Each winter, UCA has the chance to travel to Jay Peak, our local Ski Resort, to ski on Fridays and relax with friends. Currently, UCA offers sports participation in Soccer and Basketball. Also started this year was a Badminton Club and Pickleball Club. 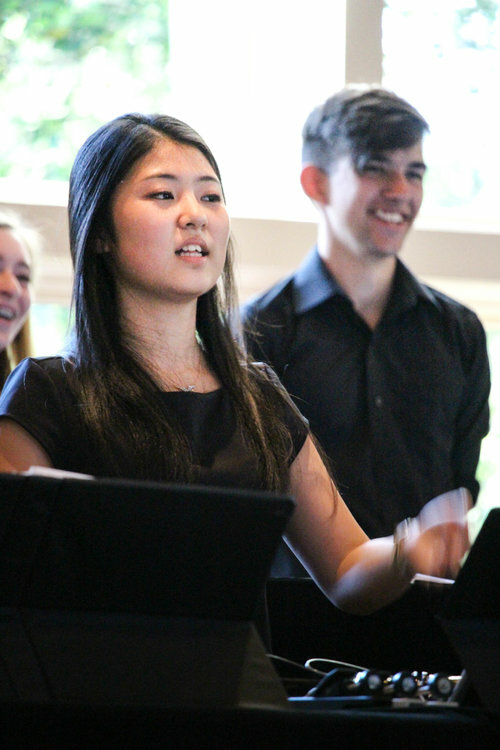 Chorus and Handbells are an integral part of UCA life. As students grow in ability they can become part of the Bronze Ambassadors. Under the direction of a nationally recognized instructor, the Bronze Ambassadors travel each year to perform. The Northeast Kingdom of Vermont is a rural community surrounded with beautiful mountains and lakes. This four-season region allows students respite from the pressures often associated with city life. This is a region boasting a safe environment. "24/7 Wall St." reported that Vermont is the safest state in the nation when reviewing violent crime rates. Students are allowed to focus on studies and skills that are invaluable for future success, guided by faculty mentors who prepare them for the next step of life. While attending United Christian Academy, students will be spending their time in what we like to call, "The Northeast Kingdom," home of the Green Mountains. Our community is located right off Lake Memphremagog and a beautiful mountainous landscape. Students enjoy outdoor activities like spending time at the lake, skiing, sightseeing, hiking, and more! The air is very clean because of the area's rural nature and being far from the city life. Taking part in the great outdoors is a highlight of many International Students. Our International Students aren't placed in dormitories, but are carefully placed with "Host Families." These families are carefully chosen. Students are able to grow socially and virtuously in a way that students could not if they were in a dormitory setting. They will have the opportunity to interact with others in the home, so as not to eliminate the value of family communication. They will be immersed in American and Vermont culture and will learn how these families live. Above all, our International Students enjoy United Christian Academy because of its production of deep and long-lasting friendships. Long after students graduate and leave for college, our students speak of their time here and the friends they made as deeply and positively influential in their lives.